The paper proposes a unified network for India of microwave Doppler weather radars with advanced digital processing designed to cover all applications such as tropical cyclone observation, aviation services, local severe storm monitoring and hydrology, with reliable communication (through satellite) and calibrating rain gauges. Integration of radar data at analysis centers with satellite and synoptic data is emphasized. Output products from the combined analysis can be accessed by specialist users. Provision for further up-gradation of the radars by adding multiple polarization at a later time is also suggested. weather systems and for areal estimation of precipitation. The best known and perhaps the largest network is that of the NEXRAD WSR-88D radars of the USA (Crum and Alberty, 1993; Crum et al., 1993; Friday, 1994; Klazura and Imy, 1993). In India, the IMD (India Meteorological Department) has a set of 10 cm wavelength radars on the coast mainly for tropical cyclone (TC) detection (CDR's) and another set of 3 cm radars at airports. These are of old technology and the IMD has plans to replace the cyclone network with modern Doppler radars. This is therefore an opportune time to plan a modern unified operational Doppler weather radar network integrated with other observational systems to serve all the following real-time applications such as (1) monitoring peak winds in cyclones and thunderstorms, locating microbursts, and tracking these phenomena; (2) recognizing precursors of convective development; (3) identifying severe weather and hail; (4) estimating areal precipitation rates and amounts and (5) detecting clear air phenomena and acquiring vertical wind profiles. To these may be added the climatological and research applications of the data. Doppler Weather Radars with computer-controlled operation and digital processing can map the three primary products, namely, (1) equivalent radar reflectivity factor (Ze), (2) mean (precipitation particle) velocity (V), and (3) velocity spectrum width (s v). Ze is correlated by statistical techniques with rate of precipitation (R) to map the distribution of instantaneous rain rates and cumulative rainfall amounts. Ze can also be related to the Liquid Water Content (M), the Vertically Integrated Liquid Water (VIL) and the fall speed of precipitation particles. The mean Doppler velocity pattern will be used to recognise signatures of vortices or divergence associated with thunderstorms, tornadoes, microbursts and tropical cyclones. The spectral width measurement would indicate turbulence. Algorithms can be developed to compute from the three primary products, derived products, e.g., echo-top statistics, probability of severe weather, hail, turbulence and icing, and tropical cyclone eye parameters such as magnitude and radius of maximum winds. Tracking algorithms for detection of development and movement of thunderstorms and tropical cyclones are also to be provided. A Velocity Azimuth Display (VAD) mode can be used to get vertical wind profiles. A sufficiently sensitive radar can detect the weak echoes from lines of refractive index discontinuity which are often precursors of thunderstorm development. Gust fronts can also be detected. Thunderstorm- related low level wind shear near airports can be monitored. Networking of the radars to obtain a composite imagery at analysis centers is essential. For reliability in severe weather, a satellite communication system is proposed. Each radar site will have communication equipment to access the INSAT satellite and transmit semi-processed data, annotated where necessary by the radar meteorologist at site. It will also receive data from calibrating rain gauges. The meteorologist at the analysis centre will have a workstation displaying composite imagery of more than one radar as well as satellite imagery and synoptic information including data from rain gauges and possibly surface-based lightning detection systems. The analyst will be aided by an expert system software to compute forecast products using the combined information, e.g., forecast movement of weather systems, predicted height and position of cyclone storm surge, areas of intense rainfall, etc. User agencies can be equipped with terminals to receive from the meteorological analysis centers through satellite, outputs of interest to them. Examples are aviation-related products for airports, cumulative rainfall maps in river catchments for hydrological users and cyclone information for disaster managers. The users will be linked to the analysis centers rather than the radar sites. Figure1 shows a block diagram of information flow. The success of the scheme will depend on proper network planning and sitting of the radars as much as on the hardware. Besides the existing coastal stations, key points in catchment areas of rivers will be an obvious choice. A display terminal at the airport for a multipurpose radar situated away from the airport, will avoid duplication and the congestion problem (real estate, frequency and sitting clearances) at the airport. Even in the case of low level wind shear a properly located off-airport site has the advantage of seeing at low levels near the runway. Radar design philosophy is discussed in detail by Viswanathan et al. (1999), in this volume. The reflectivity will be measured upto 500 km range and velocity to 250 km. A realistic assessment of the benefits and limitations of such a costly modernization needs to be made. A critical discussion of two applications (1) severe weather detection and (2) rainfall estimation is given below. Recognition of signatures of severe weather phenomena is based on reflectivity and Doppler velocity patterns. 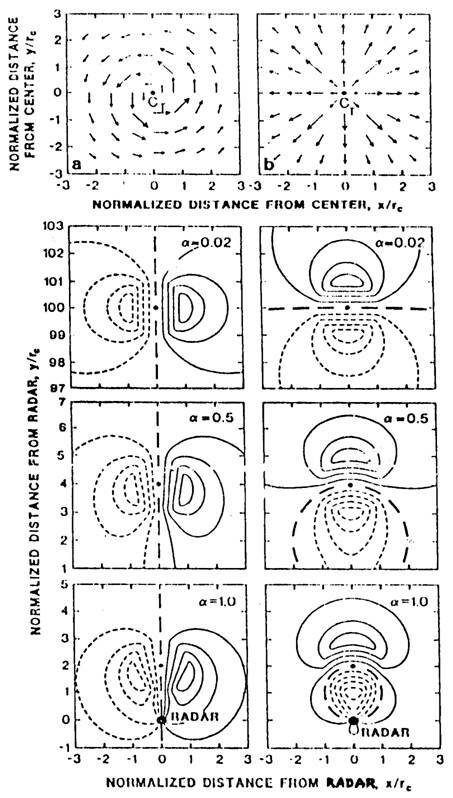 Figure 2 (from Wood and Brown, 1992) shows the horizontal flow fields in (a) an axisymmetric vortex and (b) a divergence pattern centered at point CT. The former represents an idealized tornado or the eye-wall region of a tropical cyclone; the latter a microburst situation. The patterns shown below them are the Doppler velocities that will be observed by a radar located south of the phenomenon corresponding to values of a of 0.02, 0.5 and 1.0, a being the ratio of core diameter to range. Thus, a distant vortex or divergence pattern gives a couplet of oppositely directed maximum velocities. This signature can however be complicated or missed in practice due to various reasons. For instance in the case of a tropical cyclone, the maximum velocity couplet gives the maximum wind in the cyclone. But in the absence of echo all round the eyewall, part of the pattern will be missed. Also the presence of range and velocity ambiguities will confuse the pattern. Further when the system comes closer to the radar the pattern distorts as shown in the lower figures. This causes the apparent centre of the system to shift. Usually the cyclone centre can be determined from the conventional reflectivity pattern much earlier and better than from the velocity pattern. Similarly in the case of small scale phenomena such as a tornado or microburst the radar beam may not be filled at long ranges and the couplet may not be seen. Thus interpretation can be difficult and best results are achieved by integrating all available observations. Since the Ze - R relationship is statistical, a calibrating network of tele-metering rain gauges within about 50 km of each radar site is proposed. The gauge data will be transmitted through VHF links received at the radar site. The areal average for the calibration area determined by gauge and radar will be compared to give an adjustment factor for multiplying the radar estimate. The radar and associated gauges will form an integrated system which can also be used as ground truth for calibrating satellite estimates of rainfall. While this method gives a good mapping of the areal distribution of rainfall the magnitude estimates are not very accurate. This is because the Z - R relationship depends critically on precipitation particle size distribution, shape and phase. Also the estimates in hilly terrain (where many catchments are located) may be disappointing because of beam blocking and occultation. The use of dual polarization radar measuring in addition, differential reflectivity or differential phase shift may enable determination of the drop size distribution and identification of particle phase (e.g., Sachidananda and Zrnic, 1986; Balakrishnan and Zrnic', 1990). Though this has been demonstrated in research it may take some more time for polarization techniques to be sufficiently developed for operational use. Hence it is proposed (see para 3) that provision for retrofitting of polarimetric capability to the radar at a later date should be incorporated in the design. The development of algorithms that work, for resolving ambiguities, recognizing signatures and for tracking of reflectivity patterns presents problems that have not been solved satisfactorily anywhere in the world. Hence it is not possible to think of a frozen design for the software associated with the radar. Algorithm development is a major challenge and has to be a continuing activity with feedback from field experience. Balakrishnan N. and D.S.Zrni, Estimation of Rain and Hail Rates in Mixed-phase Precipitation, J.Atmos. Sci., 47, 565-577 (1990). Crum T.D., and R.L.Alberty, The WSR-88D and the WSR-88D Operational Support Facility, Bull. Amer. Meteor. Soc., 74, 1669-1687 (1993). Crum T.D., R.L.Alberty and D.W.Burgess, Recording, archiving, and using WSR-88D data, Bull. Amer. Meteor. Soc., 74, 645-653 (1993). Friday E.W., Jr., The Modernization and Associated Restructuring of the National Weather Service: An Overview, Bull. Amer. Meteor. Soc., 75, 43-52 (1994). Klazura G.E. and D.A.Imy, A Description of the Initial Set of Analysis Products Available from the NEXRAD WSR-88D System, Bull. Amer. Meteor. Soc., 74, 1293-1311 (1993). Sachidananda M. and D.S. Zrnic, Differential Propagation Phase Shift and Rainfall Rate Estimation, Radio Sci., 21, 235-247 (1986). 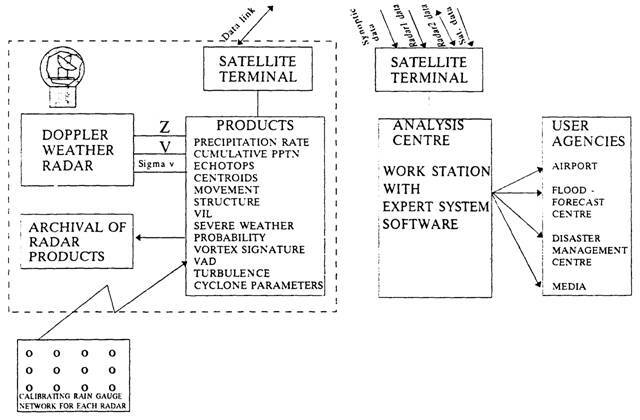 Viswanathan G., R. Ranga Rao, R. Aravindan, B. Sambasiva Rao and E. Anitha, Design Approach for a Multiparameter Weather Radar System for Hydrometeorological Applications, This Issue (1999). Wood V.T. and R.A.Brown, Effects of Radar Proximity on Single-Doppler Velocity Signatures of Axisymmetric Rotation and Divergence, Mon. Wea. Rev., 120, 2798-2807 (1992).